Walt Coburn was first and foremost a cowboy. The Montana native was the son of Robert Coburn, the founder of Circle C Ranch. In the late 1800s, this was the largest ranch in the northwest (Montana didn't become a state until 1889). Coburn cut his teeth as a cowboy, and served in WWI before becoming a full-time writer in the 1920s. From that period through the 1940s, the author contributed over a hundred stories to the pulps, predominantly “Dime Western Magazine”. From the 1930s through the early 1970s, he wrote over 30 western novels, including “Wet Cattle” in 1955. 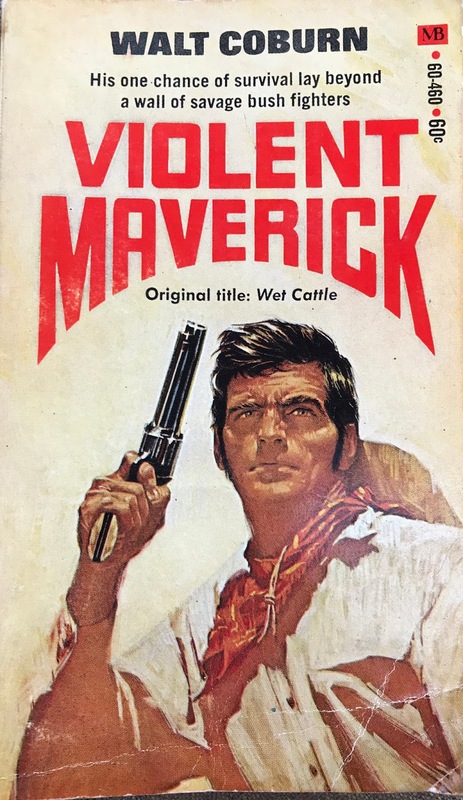 In 1970, the novel's title was changed to the much more gritty sounding “Violent Maverick” via the Macfadden-Bartell line. Penniless cowboy Pat Roper saved Mexican bandit Pablo Guerrero's life in a prior gun-battle. Pablo runs into Roper in a firefight over stolen cattle at the Arizona-Mexican border. Pablo gifts Roper the Two Block ranch, 25,000 acres of good feed, water and a some start-up cattle. The problem is that Pablo is running guns through it in an attempt to overthrow the Mexican government. Roper, not digging into the devil in the details, accepts the gift and takes the ranch. He later finds out that Pablo's lifetime enemy, Wig Murphy, borders the ranch with his own cattle empire, and he's crushing the Two Block ranch out. Coburn's validity as a real cowboy is a catch-22. While his books possess dirty, dusty realism, they are written in “cowboy” terminology that's sometimes really hard to decipher. It's this element that dampened what was otherwise a well-crafted story in “Violent Maverick”. It's a short read at 140-pages, and has a breakneck pace that had me finishing it in less than two hours. Was I maniacally rushing so it was over quickly, or because I wanted to learn the fate of young sod-buster Pat Roper? Probably a little of both. The end result is just another dog-eared, yellowed western that passes the time.